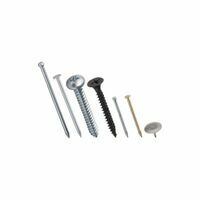 National Hardware Nail Screw Kit, Series: V7709, Steel Housing Durable and reusable container with multiple sizes nails, tacks and brads. Contains enough items to complete multiple projects. Durable and reusable container with assorted sizes of eye hooks, cup hooks and shoulder hooks. Contains enough items to complete multiple projects. Marksman Pro is designed for multiple deck applications. For installation of treated lumber decks. The Pro-X1 is designed with a 1/16" spacer to allow the smallest of gaps between deck boards. Ideal for installation of wet treated deck boards that will shrink as they dry naturally. Ideal for 1"+ materials with 6" board width on 16" joist spacing. Economical, efficient and attractive fasteners are essentially invisible. All fastening work done from top side. Relieves stress caused by natural shrinkage of deck boards. Only one EB-TY and one screw required at each board/joist intersection. Affords easy deck resurfacing by eliminating nail pops. 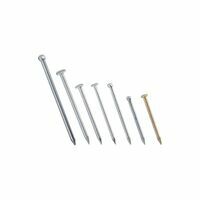 Corrosion-resistant trim head Swaneze stainless steel finish screws included. Formed from UV-resistant polypropylene; Deck Packs Contains: 175 EB-TYs, 190 screws (#7 x 2-1/2"), 12 IPE wood plugs.